​Since her recruitment in 2015 from the Midland County Humane Society, Ladybird has climbed her way tooth and claw up the corporate ladder here at Good Stead Farm. Starting her career as a pest control technician, she has since held positions in our security, product testing, and livestock support divisions. She is now Vice President of Good Stead Farm’s Public Relations department. Although she’s very busy these days Ladybird always makes time to greet visitors. She invites you stop in for a belly rub soon and often. 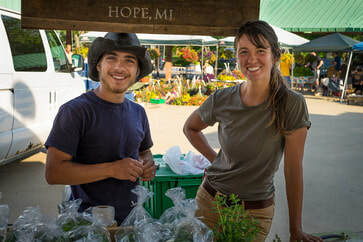 ​Nick is from Missaukee county in Northern Lower Michigan and has been attracted to the subject of agriculture since a young age, despite not being from a farming background. Nick is specifically interested in sustainable, organic farming and in learning about ways to live off the land. While he does not know where it will take him, he plans to continue learning about sustainable farming and how it can benefit local communities. Nick is pleased to have the opportunity to spend the season with Good Stead Farm and is enjoying all that he is learning. ​Julia hails from the Minnesota suburbs. While she didn't have any farming experience, she knew she'd like the work. Plus, she was ready to get her hands dirty! She enjoys spending time working with the animals in particular and when not working, loves exploring. She is continuously learning about the farm runs and how the vegetables grow - and she is enjoying every minute of it. She hopes to use this time on the farm to learn more about what she might want to do in the future and to gain valuable life skills along the way. Beginning in high school, Evan began spending much of his time learning about the world of small-scale agriculture. At his home in Rochester, Michigan, he self-studied through books and any information-rich media on the internet. While on a trip to visit his wife in British Columbia, Canada, he took the opportunity to shadow a small-scale vegetable farmer. This left him with a tangible taste of the physical aspects of farming that he'd only yet read and listened about. He left this experience with the desire to pursue hands-on work. Evan found Good Stead Farm while in search of an educational opportunity that would be guided by an experienced small-scale farmer. He looks forward to one day having a farm of his own with his wife, Cassie.